ATF price in Delhi was reduced by Rs 4,765.5 per kilolitre (kl), or 11.9 per cent. Aviation turbine fuel (ATF), or jet fuel, on Monday got cheaper by a steep 12 per cent and rates of non-subsidised cooking gas LPG were slashed by Rs 82.5 per cylinder as global prices continue to tumble. ATF price in Delhi was reduced by Rs 4,765.5 per kilolitre (kl), or 11.9 per cent, to Rs 35,126.82 per kl, oil companies said on Monday. This is the third straight monthly reduction. Prices were last cut by 10 per cent on January 1. 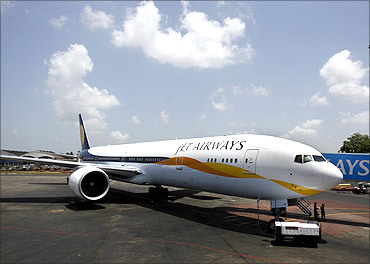 Jet fuel constitutes over 40 per cent of an airline's operating cost and the price cut will lighten the financial burden on cash-strapped carriers. No immediate comment was available from airlines on the impact of the price reduction on passenger fares. Simultaneously, the oil firms cut prices of non-subsidised LPG, which consumers buy after exhausting their quota of 12, by Rs 82.5 per 14.2-kg bottle. Non-subsidised cooking gas (LPG) now costs Rs 575 in Delhi as against Rs 657.50 previously. The reduction comes on the back of three consecutive price hikes in as many months. Rates were last hiked by Rs 49.5 on January 1. Prior to that, non-subsidised LPG price was raised by Rs 61.50 on December 1 and by Rs 27.5 per cylinder on November 1.